What’s this? More fantastic 90’s yummy treats? Yes, I’m going to make you all relive all your childhood birthday parties with these goodies! Think back to any kids party you attended during the 1990’s in Australia and you’ll remember that the menu’s were all pretty simple and all very similar. Chocolate crackles, honey joys, fairy bread, party pies and sausage rolls drowning with tomato sauce, chicken wings, cocktail hot dogs that were stabbed with way too many toothpicks, and of course, the piece de resistance; the character cake smothered with lashings of buttercream straight out of the Australian Women’s Weekly cookbook. It was a special treat to get any of these things, you held out all year just to get an invite to so-and-so’s party because their mum made the best crackles, or because somebody else always had really cool lolly bags that always had 2 boxes of Smarties in it. And because it was a treat, you acted like it was such and stuffed your face with as much of it as possible. I always ate at least 2 big pieces or 4 small pieces of fairy bread, and of course I had to have at least 2 chocolate crackles. And if it was a family birthday party that I attended, be it mine or a cousins or my brother’s, we might’ve been lucky enough to get some of our Nan’s creations, including the delectable sponge lilies, her sausage rolls and as we got older, her world famous Cherry Ripe Cheesecake (which was fought over, usually by the adults. Don’t deny it.). 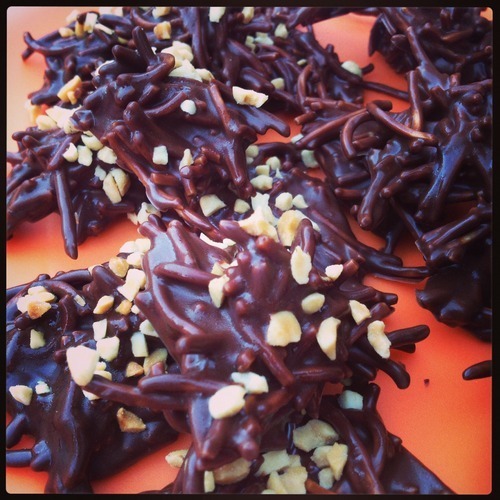 And sometimes at parties, you were lucky enough to find these Chocolate Peanut Butter Spiders. They never lasted long, so you had to get in really quick! CTO loves these, and I spotted them on the dessert table at Miss G’s little friend Master O’s 1st birthday party last month. As soon as I gave it to him, I was told that I had to make them for Miss G’s party. Funnily enough, a lot of my friends also made them for their babies 1st parties too! Ms R, you trendsetter you! When planning out Miss G’s robot party, CTO and I (mostly me) wanted to make it as old school as possible. So we had party pies, sausage rolls, chicken wings, fairy bread and the classic Kellogg’s treats; chocolate crackles and honey joys. And I made my One Bowl Chocolate Brownies in mini muffin bites and some pork dumplings, just to be different. And I rounded it out with a nice AWW inspired robot cake. I’ll put up photos of it soon. 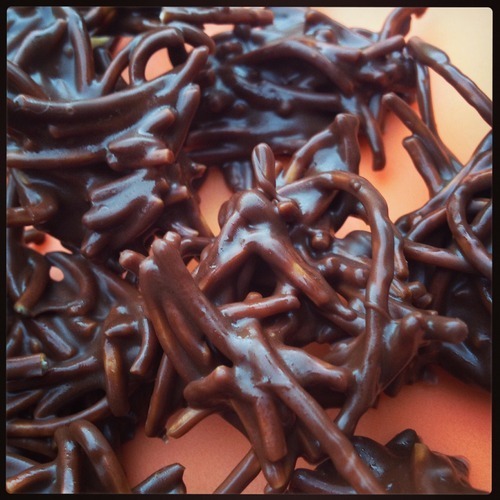 And of course, we had chocolate spiders. These are easy to make, just as simple as the Chocolate Freckles I posted on here last time. You only need 3 ingredients; chocolate, peanut butter and noodles. Zap, stir, spoon and set! And like the previous recipe, it’s a great one to involve the kids. Who doesn’t love that crunchy noise as the hot goopy chocolate hits the noodles? Now, for those of you who remember making these before, you probably remember seeing the recipe on the back of the Chang’s Original Fried Noodle packet. It’s the same one, I’ve just made it slightly healthier. Slightly. Also, you don’t have to use the Chang’s brand. There’s a long clear-ish bag with about 5 cooked cakes of fried noodles in the Asian section of most major chain supermarkets, one brand I use is called Dragon & Phoenix. They are a lot cheaper, and if you are making bigger quantities of the spiders this is more cost efficient. Plus, they make great croutons for salads and coleslaw. CTO can vouch for that! D&P noodles are a bit thinner, but work just as well as Chang’s. Just crumple up the cakes into smaller pieces and weigh out the correct amount required for the recipe. You also don’t have to use peanut butter if you don’t like it, or can’t eat it due to allergy reasons. Try using other nut butters like cashew or almond, or even try tahini, Nutella or coconut spread/butter. You just need something to soften the chocolate. Without that something extra, the spiders will be hard as rocks and very hard to eat. Place the chocolate and peanut butter in a microwave safe bowl or jug, and microwave on high in intervals of 30 seconds until melted, about 1-1.5 minutes. 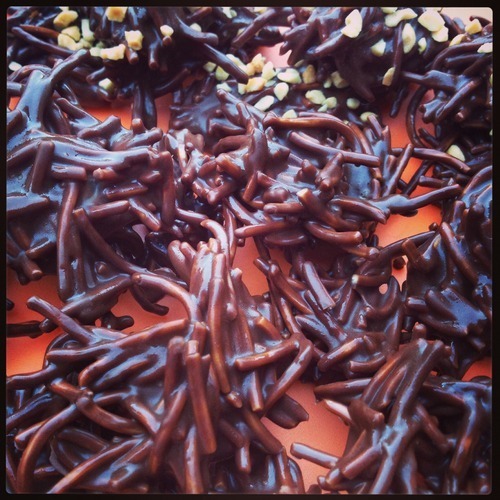 Pour chocolate and noodles into a medium size mixing bowl, and with a rubber/silicon spatula fold the noodles through the chocolate mix until thoroughly coated. With a dessertspoon, place dollops of the coated noodles on the paper lined trays, the size is up to you. Sprinkle nuts or sprinkles over your spiders if you would like to. Refrigerate or freeze until set, then peel off trays and store in a plastic container in the fridge. Notes: You can use milk chocolate and regular peanut butter, these were just my ‘healthier’ preferences. Crunchy or smooth, it doesn’t matter.